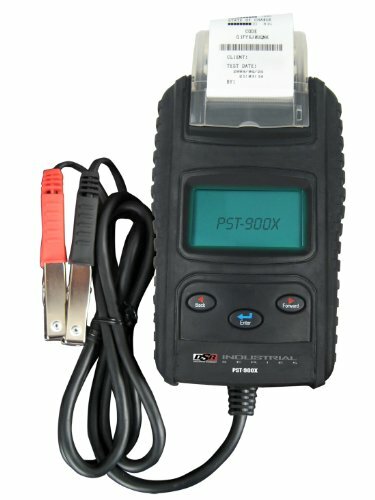 Schumacher’s PST-900X Battery Tester has 3 testers in, Battery Tester for testing 6 and 12 Volt batteries, Charging system tester for testing 12 and 24 Volt charging systems and Starting system tester for testing 12 and 24 Volt starting systems. This unit includes Thermal printer, rugged carrying case, 50 ampere battery clamp, 1 roll of standard thermal printer paper and 6 AA batteries. This unit tests and displays the results of battery voltage test, battery load test, state of charge of the battery, state of health of the battery, etc.